Acevedo, a chapter coordinator for the UNDP Human Development Report on El Salvador, agreed that this country has met the MDG target on water access. But he added that over the last three years, the country has fallen behind again due to lack of continued public investment, waste of water resources, and population growth. In addition, cases of corruption were discovered in the Administración Nacional de Acueductos y Alcantarillados (ANDA), El Salvador's main water and sanitation company. Carlos Perla, president of the enterprise from 1994 to 2002, is now in prison on charges of corruption. Acevedo told IPS that water quality in this Central American country is a "disaster" and added that "no one is recommended to drink the water provided by ANDA or any other provider." The census of El Salvador's population has drawn to a close, and according to preliminary figures cited in La Prensa, there are fewer Salvadorans in El Salvador than officials were projecting. The last official census was in 1992, right after the conclusion of the armed conflict. Calculations based on that census, using assumptions about birth rates, migration and mortality had come up with estimates that there should currently be about 7.1 million people living in the country. Now that 18,000 census takers have gone door to door throughout the country, the actual count appears to be no more that 6.7 million, and could be as small as 6.1 million, according to La Prensa's sources. According to officials, possible reasons for the lower population figures include migration, fewer children per family, increased levels of education, increased coverage of health services, and increased participation of women in the labor force. The latest public opinion poll published recently shows continued dissatisfaction with president Tony Saca. The poll was conducted by the Institute for the Study of Public Opinion at the University of Central America. Saca's job approval rating is at 5.71 on a 10 point scale, down from 7.27 when he started his term three years ago. 38% believe Saca has governed well, 31% say he has governed poorly, and 31% neither well not poorly. 50.3% of respondents believe crime has increased during Saca's term, and 63.5% believe that the economoic situation has worsened. Despite the government's assertions that the economy is growing nicely, the majority of the Salvadoran population does not believe the economy is benefiting them. Will she be PDDH or rector of the university? Beatrice Alamanni de Carrillo is the current Procurator for the Defense of Human Rights (PDDH in its Spanish initials) and has been an outspoken advocate in that role. But will she continue? Her term as PDDH ends in August, and she is a strong contender to be renamed by the National Assembly to that post. However, in an interview with La Prensa Grafica, she revealed a strong desire to be the next rector of the University of El Salvador when the current rector leaves that post in October. Salvadoran President Tony Saca paid a surprise visit Wednesday to his country's troops in Iraq and later said they were in good health and high spirits. "I want to tell the Salvadoran people that morale was very high," Saca said in a statement after he spoke to soldiers in Kut. Salvadoran troops are doing peacekeeping and humanitarian work in the southern city. With about 380 soldiers, El Salvador is the only Latin American nation still part of the U.S.-led coalition in Iraq. Honduras, Nicaragua and the Dominican Republic have withdrawn troops. Saca, who was dressed in sand-colored military garb, became the first civilian president of El Salvador to wear the uniform of a commander general of the armed forces, according to LaPrensa. LaPrensa has a photo gallery of the visit here. There are 22 months to go before the March 2009 elections for President and National Assembly in El Salvador, but already the campaign is a major theme in the Salvadoran blogosphere. The current round of comments were triggered by a political rally led by president Tony Saca, where he made comments which many described as "war-like." Blogger Hunnapuh takes note(ES) of Tony Saca's call to the governing right-wing ARENA party faithful to create an army of "nationalist soldiers," with Saca warning that "he that sleeps loses, there can be no vacations." La Prensa Grafica had a recent article with photo gallery concerning the current excavation of a tunnel at the San Andrés archeological site. At San Andrés, ancient Mayan peoples had erected an acropolis consisting of a stair-stepped temple and other structures. The latest excavations have found more remnants of the Mayan civilization as archeologists tunnel into the site. You can see an extensive photo gallery from the site and its museum here, and a 360 degree panorama of the San Andres site at this link. CERRON GRANDE RESERVOIR, El Salvador, May 17 (Reuters) - An artificial lake in El Salvador brimming with sewage and industrial waste is mystifying scientists by attracting thousands of migratory and sea birds. Built in 1974 to drive El Salvador's biggest hydroelectric project, the 33,360-acre (13,500- hectare) Cerron Grande reservoir collects some 3,800 tonnes of excrement each year from the sewage pipes, as well as factory run-off and traces of heavy metals like chromium and lead, the government estimates. So scientists are puzzling over the fact that some 150,000 seabirds from more than 130 species have chosen to make the reservoir their home. At least 90 of the species are migratory birds arriving from as far away as Alaska. Drawn by nostalgia and price tags of $12,000 to $200,000, Salvadoran immigrants are continuing a tradition of celebrating financial success in the United States by purchasing a vacation or retirement house in their home towns. Still, the steady stream of buyers might soon swell to a flood as El Salvador's government and developers mount increasingly aggressive efforts to attract even the lowest-income earners of the roughly 1 million Salvadoran-born immigrants in the United States -- including at least 130,000 in the Washington area, where they are the region's largest immigrant group. 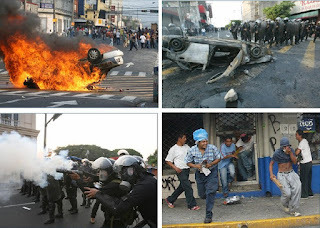 It is a scene which repeats itself with unfortunate regularity in central San Salvador. The authorities take some action against the informal street vendors who fill the streets in the city's central center. The vendors clash with police, windows are smashed, something is burned, tear-gas is fired. Yesterday it was the seizure of pirated DVDs and CDs being sold on the streets in the city center which touched off the clashes. For four hours, police clashed with vendors. A police car and two other vehicles were set ablaze. Several businesses were looted, including a bicycle shop where news photos showed looters carrying off their ill-gotten bicycles down the streets. El Salvador and Honduras signed a free trade agreement with Taiwan, allowing those countries to export products duty free to Taiwan. The Los Angeles Times published a story about war tourism in the area around Perquin in Morazan province. BanColomibia is completing its acquisition of the Salvadoran bank Banagricola. In a speech on the Day of the Soldier, President Saca announced a plan to modernize El Salvador's armed forces including the purchase of additional helicopters. Saca justified the additional spending by referring to the role of the El Salvador's armed forces in relief efforts during natural disasters as well as "a rising tide of dangerous populists" who pose an external threat to El Salvador. Total murders in El Salvador rose to 1154 through the end of April, an average of slightly below 10 homicides per day. January - 310, February - 268, March - 270, April - 306. In the past couple of weeks many of you have heard reports of the current crisis that has engulfed the Just Garments factory here in El Salvador. We wanted to inform people about what's been going on with JG, and let people know what are some probable next steps. National elections are almost two years away in El Salvador, and yet the political parties are already readying their troops for battle. In fact, president Tony Saca has called for the party faithful of ARENA to be "nationalist soldiers" campaigning against the forces of the left. The hand-painted sign strewn tightly across the road read: “Don’t undermine the dreams of Santa Marta ’s children.” In front of the sign, representatives of 50 families from the small community located in El Salvador ’s northern Cabañas province. For the last eight months, they have been threatened with eviction from the land they have worked for 20 years and owned for thirteen. Community authorities hold a title to the land, which was purchased for $26,400 in 1994, but the validity of that title was recently challenged in court by the former owner, Ms. Maria Elba Beltran, who says that she never received compensation for the land in question. The Conference of Bishops of the Roman Catholic church in El Salvador has issued a statement of opposition to gold and silver mining in the country. Citing the biblical commandment to care for creation, the bishops placed themselves squarely against mineral exploitation in El Salvador. The bishops cited as reasons for their position (a) the irreversible damages caused by mining to the environment and surrounding communities, (b) serious health problems caused by significant use of cyanide in the extraction process, (c) inevitable contamination of waters and the subsoil, (d) negative impacts on flora and fauna, and (e) the multiplication of these effects in a country as small and as densely populated as El Salvador. According to the bishops, no supposed economic benefits can compare to the value of human life impacted. Commencing on Saturday, May 12, 2007, El Salvador will conduct its first national census since 1992. More than 18 thousand polltakers will spread out through the cities and villages of El Salvador over the following 16 days to assemble an official count of the population. They will visit some 1.6 million homes. An article in El Faro examines the variety of problems facing polltakers, particularly in areas of the country where the level of crime is high. Plans are in place to provide security for polltakers, and to involve community leaders to offer guidance on the ways to approach violent neighborhoods. The lack of trust of the people living in these areas may make them reluctant to allow polltakers into their homes. The government has started a publicity campaign to familiarize the population with the census and the questions they can expect. Tutela Legal presented its annual report for 2006 where an increase in violence fitting the profile of extra-judicial executions stood out. Mauricio pointed out that during the past year Tutela Legal investigated 233 cases of killings which were classified as homicides: attributed to gang violence (used as hit men in order to execute other persons), the illegal use of police force, prison killings, among other cases. "Violent homicides, the past year, generated 3928 deaths, an average of 10 persons per day; those patterns of systematic crimes evidence the participation of organized groups that repeatedly perpetrate this type of act," he said. The mayor of Los Angeles, Antonio Villaraigosa, was in El Salvador this week (while his city's police were losing control and beating up May Day protesters). As this NPR story tells, the mayor wants to work with El Salvador on the gang problem which plagues them both:Some of the most dangerous gangs in Los Angeles have strong ties with the Central American country. The Los Angeles area is home to as many as a million Salvadoran immigrants. One of the greatest commonalities between the two areas is gang violence, particularly the Mara Salvatrucha and the 18th Street gangs that were born on the streets of Los Angeles. El Salvador, the only Western Hemisphere country with troops serving alongside U.S. forces in Iraq, continued its support for the Coalition by dispatching an eighth contingent of troops to Iraq in December, and President Tony Saca publicly expressed his intention to deploy a ninth unit.